Further to my post about being able to light a fire in the rain, (http://www.theultralighthiker.com/how-to-light-a-fire-in-the-wet/) I have also long toyed with the idea of carrying/constructing a fire rain hat or raincoat so that heavy rain doesn’t put out your fire. The two occasions when it is really important to be able to light a fire are when it is very wet and cold and when there is a bushfire approaching (so that you can create burned ground as a refuge!) On such occasions if you don’t have a lighter, or can’t light a fire you’re a dead duck. Smokers clearly have an advantage here over more sanctimonious folk, and even though I gave up smoking more than a generation ago (! – there is an interesting method of measuring time) I still always carry a ‘Mini-Bic’). We always camp in a shelter which allows a fire outside. 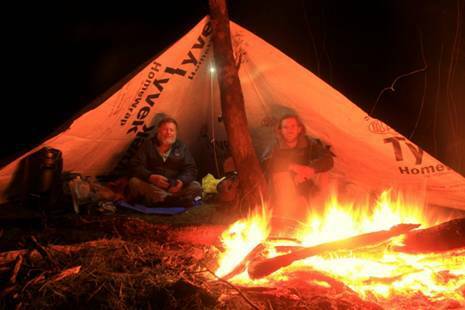 A tent is a cold, creeping thing to have to retreat to when you can sit/stand in a warm open shelter, drink rum, play games, read etc in front of a cheery fire – and with a warm back! If you pitch any rectangular tarp high you can have a (small) fire at one end (though the wind tends to catch the tarp if it isn’t pegged to the ground on at least 2/3 sides). I think it should be possible to suspend over the fire (eg a 1 metre square) diamond of eg ‘Tyvek’ @ 1.75 ounces /square yard and a melting point of 800C. You need to be careful that the fire can’t ignite its ‘roof’ or use it as a wick to ignite your tent, but this shouldn’t be much of a problem in the rain. Set-up obviously needs to be when furled (a couple of rubber bands should achieve this) so you can pitch it over the fire when it is already lit. Weight should be able to be kept to less than 3 ounces (90 grams) including stakes and guys. Tyvek, with its 800C melting point should make a good material for this ‘rain hat’. It might be better to use the material that fire blankets are made from for this purpose. A ‘Standard’ Australian Fire Blanket (cost approx A$20 such as has lived in our kitchen for 20+ years) appears to be made of woven fibreglass and measures exactly 1 metre by one metre and weighs 427 grams, so it will (pitched diagonally – like the tyvek shelter in the photo) make an excellent small waterproof shelter for a fire. The fact that it will reflect otherwise wasted heat straight back into your tent will also mean you use much less fuel and can have a much smaller, safer fire. I would use a stainless steel fishing ‘leader’ as the guy on that side of the tent (with a ring at an appropriate point on it to secure the top corner of the blanket) and pitch the fire tent over it and pegged to th ground on the other three sides. Tyvek Fire Tent’: We always camp in an open shelter (something like the one above in he photo) with an open fire out the front. So warm and cozy even on cold,wet days. This shelter is very easy to make. It consists of a square of Tyvek ‘Homewrap’ (available Bunnings in 30 metre rolls for a bit over $150) 8’ x 8’ square. The ‘wings’ consist of another square the same size cut in half. One of these can be cut right off the roll; the other has to be sewn or stuck on (using Tyvek tape). (You end up with an isosceles triangle @ 16′ x 23′ x 16′ on which you pitch like this. You can bring the ‘wings’ in towards the tree if rain/wind moves around to that direction – which it almost never does!) The tie-outs are tarp holders from Aussie’s. I have spent a night sitting (on a piece of thick bark) in front of a fire in the open on frozen ground, in a light snowstorm wrapped only in one of those mylar ‘space blankets which fit inside your breast pocket (Never be without one!). It wasn’t very comfortable, and I didn’t get a lot of sleep – but I am still here to tell the tale. Expect things like this to happen to you, and be prepared!